M&M's will be launching three new, limited-edition M&M's Peanut flavors at the tail end of this month for an international-themed Flavor Vote campaign. 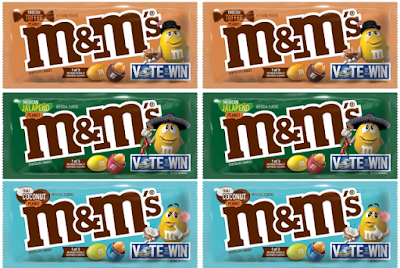 The candy brand wants you to choose from Mexican Jalapeno Peanut, Thai Coconut Peanut, and English Toffee Peanut. All three flavors will be available starting January 28, 2019 at retailers nationwide so that you can try them before placing your vote. Starting January 28, you can vote on your favorite by going to www.flavorvote.mms.com or texting the word "Vote" to 84444 and following the texted instructions. You're allowed to vote once per day through May 17, 2019. The flavor that nets the most votes will be announced in August 2019 and will stick around on store shelves.